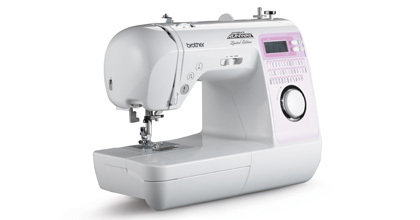 Whether you're new to fashion sewing or a skilled veteran of the fitting room, you'll love the creative potential the Brother Innov-ís 40 brings to your design table. Beginners will appreciate the free-motion stitching and quick-set bobbin which prevents top bobbin jam. It also has a built-in automatic needle threading system. As any experienced sewer knows, threading the sewing machine can be a struggle for beginners. With this sewing machine, that job is done for you so you can focus on what really matters in your sewing adventures! Dream it, then do it with the Brother Innov-ís 40's wide array of decorative stitches and convenient machine features. Made by Brother, powered by your imagination!